The two-speed fixed gear hub was developed in the mid-90s by staff at The Bikesmith, fixed speed headquarters for hilly Seattle, Washington, a surprisingly fixed gear town. It is built on a two-speed Bendix coaster hub by the experts at The Bikesmith--motto: 'We can fix anything'. This article provides an enthusiast's basic low-tech overview of the hub. The two-speed FG hub (hereafter called, for lack of a better name, the 2FG) was the brainchild of Brandon, trialsin expert, fixed gear rider and mechanic working at The Bikesmith, during a lunchtime engineering exercise. He wanted to develop a fixed gear hub that could be shifted on the fly rather than 'flipped.' As he didn't have the very rare Sturmey-Archer three-speed fixed gear hub to examine, Brandon worked from theory, drafting the protocols and presenting them to Val Kleitz, Bikesmith owner and instigator, who would critique his plans and send Brandon back to the drawing board. Shortly thereafter two of the other highly experienced mechanics at the shop discovered Brandon's effort and teamed up for their own development process in competition. Before long the three had pooled their knowledge and were working together. Their first trial used a standard Sturmey-Archer three-speed. However, the resulting gear had nearly a half-revolution of 'pedal slop' rather than the tight spin of a fixed gear. This led to redevelopment using a Bendix two-speed coaster hub. 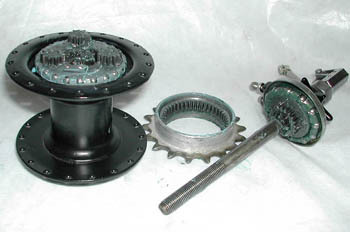 An unconverted Bendix hub uses a planetary gear system. A large cog or 'sun pinion' on the axle is ringed with smaller gears mounted in a 'planet cage' and engaging in turn with an outer 'gear ring'. By means of a mechanism sliding through the hub's centre and connected to a trigger, the user can choose to route torque from the pedals either to the hub shell for direct drive, or via the gear ring and planets for a reduction gear. Sprung dogs provide a simple freewheel. The 2FG achieves its 'fixation' by brazing the sun gear/hub shell/planet cage and ring gear into an inert assembly, which can be engaged or disengaged from the axle using an 'on/off' toggle--the original Bendix shifter or any other friction shifting mechanism will work. Using this system, 'dead spinning' is reduced to about 1%, similar to that in a single-cog fixed gear. The rear cog, a Bendix-specced 18 tooth, cannot be changed. To change the gear setup, you must exchange the chainring. Despite my faith in the expertise of the developers, I had been a little skeptical about the capabilities of this system. In the event, I was favorably impressed, although at times rather startled, during the test ride. The shifter used was a BarCon, and I test rode the bike in city streets, on sidewalks and across several front lawns. I found the shifting to be crisp and very stable, with no lag and no discernible slop. The startlement came when I shifted on flat terrain and my spin abruptly changed, without the rattling of friction shifting, the slight chop of index shifting or the subtle 'soft spot' of a three-speed. In either gear, the ride felt precisely like a single-cog fixed gear, including working it up and down hills. Trackstanding proved Bikesmith's claims that the sytem virtually eliminated slop. Bikesmith have manufactured 13 or 14 of these hubs. Early on in development there was one hub failure, ascribed to too high a temperature in brazing. The manufacturing technique was changed and there have been no subsequent failures. 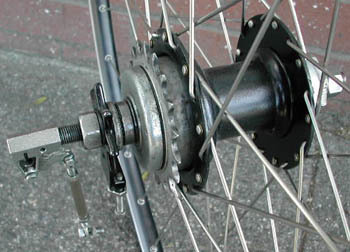 Aftermarket problems have generally involved user installation: the hub needs to be correctly adjusted before mounting into the dropouts, then secured, without movement, very tightly into the dropout. There have been a few reports of the hub spinning loose as a result of improper installation, necessitating readjustment and remounting. The hub also requires good dropouts which can achieve a very tight fit. Bikesmith specs the hub with a chain tug to help prevent the wheel from being pulled askew under load. It is also worth mentioning that the built wheel comes in slightly under 4lb, although of course this is mitigated by the fact that the weight rotates at the center rather than the periphery. Your humble reviewer could probably herself stand to lose somewhat more than the weight of the 2FG, so this consideration would not prevent me from purchasing one. The 18 tooth cog specced with the Bendix is the burliest cog I have ever seen, and has held up well even in the grainy Seattle winters. I would consider one of the best applications for this hub to be offroad usage in hilly terrain, and cyclocross racing/riding. The high/low gear provides variability not only in climbing, but also a more knee-friendly lower gear for decelerating during tricky descents. In a muddy 'cross race or a wet off-road ride, the internal gearing provides reliable shifting without the mud packing that dogs derailleurs. The 2FG hub is a worthy consideration for the on-road or offroad fixed gear rider who rides hilly terrain and desires 'flip-flop' gear variability on the fly, and it is certainly a lower-cost solution than the rare and expensive S-A ASC hub. Genny G. is a Seattle urban fixed gear rider who believes the future is uncertain and the end is always near. Photos © Genny G 2003. To our sorrow, Bikesmith closed in Feb 2004. Genny writes about her memories of the shop here. Genny rode RAGBRAI and wrote up her story for us. Lewis Campbell has a brief How To on DIY Bendix hacking.